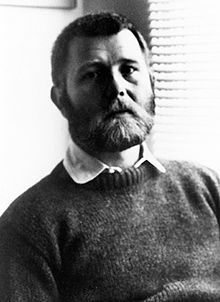 Michael McDowell (June 1, 1950 – December 27, 1999) was an American author of genre and non-genre works, best known for his horror novels and his original screenplay for Beetlejuice, the 1988 movie directed by Tim Burton. His first novel The Amulet was published by Avon in 1979, followed in 1980 by Cold Moon Over Babylon. Both novels helped establish McDowell as a serious contender in the burgeoning horror market, with an engaging voice and a talent for writing wholly effective Southern gothics. His 1981 novel The Elementals is what I consider to be a classic of modern horror; it’s one of a select few novels that sent genuine chills down my spine. His 6-part epic Blackwater series chronicled the horrors of the Caskey family, and firmly cemented McDowell’s place in the pantheon of writers of the true Southern gothic. McDowell wrote several other novels throughout the 1980s, including horror novels Katie, Gilded Needles, and Toplin, published as part of the Dell Abyss line. Toplin was also issued in a signed, limited hardcover edition by Scream Press, included in the gallery below. McDowell wrote a three-book literary saga chronicling the lives of Jack and Susan, ranging from the years 1913 to 1953. He also wrote several novels under the pen names Axel Young and Nathan Aldyne, plus several series titles under the names Preston Macadam and Mike McCray, and the novelization of the movie Clue. McDowell met with success in Hollywood with his Beetlejuice screenplay, as noted above, and went on to work on The Nightmare Before Christmas and the adaptation of Stephen King’s Bachman novel Thinner. He wrote many episodes of popular suspense and horror shows popular throughout the 1980s and 1990s including Tales from the Darkside, Tales from the Crypt, Alfred Hitchcock Presents, Monsters, and Amazing Stories. McDowell was born and raised in southeastern Alabama. According to Douglas Winter’s Faces of Fear interview, he moved to Boston after graduating high school in 1968 to attend Harvard and study English. After graduating from Harvard with a Master of Arts degree, he earned a PhD in English from Brandeis University. He was working as a secretary in 1977 when he saw a trailer for the movie The Omen, which inspired him to try something different and ultimately write The Amulet, which sold in a two-book deal to Avon. The sale gave him enough money to quit his job and write full time. After many prolific years and much critically acclaimed fiction to his credit, McDowell was diagnosed with AIDS in 1994. After the diagnosis, Wikipedia reports that he taught screenwriting classes while working on commissioned screenplays. He died in 1999 in Boston. Tabitha King, who shared an affinity with her husband for McDowell’s work, completed an unfinished novel left behind among his papers; Candles Burning was published in 2006. For anyone looking for more information about Michael McDowell, I recommend Douglas Winter’s 1985 book, Faces of Fear. You can also hunt down Fangoria #40 from 1984, which featured an interview with McDowell by Stanley Wiater. Better yet, check out this website – Cold Moon Over McDowell – a seriously dedicated fan site with lots of great stuff to explore. The fine folks at Valancourt Books have reprinted, or have plans to reprint, much of McDowell’s horror fiction. To view a list of McDowell’s books available in print and ebook formats, please click here.